I'm a scardy-cat. I'll be the first one to say it. I even blogged about it once, a couple years ago, when fear made me abandon Mutt. If you haven't read it, you might want to now. Then you'll understand about the eyes. On April 1st, I spoke to a friend about my fear of tornados. I was leaving San Antonio the next day for a trip across tornado alley, back to my home base in Pennsylvania. Laren offered encouragement, and instruction that if I were to ever be in the path of a tornado, don't try to outrun it....drive away at a 90 degree angle. "great" I said "unless your on an interstate and only have one direction to go". But I wasn't too worried. After much debate over cost, I had installed a new app on my iPhone called imap weather radio. Unlike other weather apps, this one tracks you as you travel using background GPS, so you can get alerts without constantly resetting your location. The next morning, my friend Ron and i did a little caravan to Austin, where we spent some time eating pizza before parting ways. We had discussed my stopping over in Dallas to see my friend Vickie. I knew she was busy with family commitments during this time period, but thought I might stop at the Flying J there, where I had had an adventure on a previous road trip. I spent Monday night in a parking lot in Waco Texas, continuing north on I-35 the next morning. We dawdled that morning, as vandwellers are prone to do, putting our approach to Dallas at a little after lunchtime. I took the next exit. By now I could hear tornado sirens. This was very possible. Why in the hell was I even surprised? As I came down off the exit, I thought briefly of going under the underpass for shelter from hail, but feared traffic would force me to the other side, which just happened to be the edge of a town called Lancaster Texas. I opted to pull into a restaurant parking lot to seek shelter. Alerts were coming over my phone, and there was a confirmed tornado on the ground. The alerts were tracking it, advising towns and certain exits on the interstates of it's approach. I wasn't sure what exit I had taken. I was parked beneath the sign high on the overpass, but in the darkening storm, couldn't read the number. I wanted to go into the restaurant, but no dogs allowed, said an employee at the curb. We were going to have to sit it out in the Rondyvan. Fear has a mass, a tangible thickness, and it was centered in my chest and throat. I texted my boys that I loved them. Then, it was the eyes. Mutt sat in front of me, staring. We often spend a lot of time just looking into each others eyes, and at this moment, amidst the wailing sirens and approaching darkness, I saw deep into his heart, and saw faith. He was just waiting for me, to make sense of all this. I thought once more about the rest rooms in that building, then did the only thing I could do. This time, I didn't abandon my dog. This time, I wrapped him in a blanket and fed him his liver treats. I assured him he could have every last one of them. I am sure I didn't fool him, with my pretend cheerful voice. He knew I was scared. But I was there, and that is all that mattered, in the end. I watched a huge dark mass tracking up on the other side of the overpass, over the town of what turned out to be Lancaster. I wasn't sure at first, because I couldn't see the narrow base of the funnel because of the overpass. I was disoriented as to direction. Did I mention I was scared? As I watched it pass, my relief was short-lived. Reports of a second tornado were being broadcast. But the fear changed. There was a deep sense of acceptance, of purpose. And the relief that, after all, I could do the right thing....I saw it in his eyes. 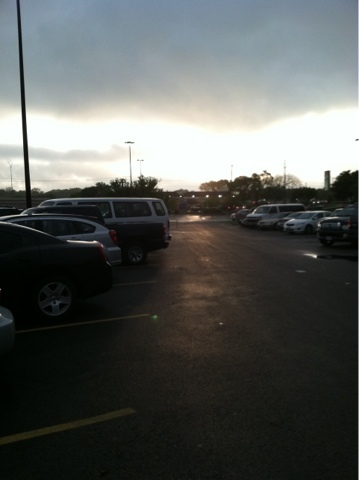 The photo below was taken in the parking lot of the walmart in Lancaster. The proverbial light after the storm. I know a lot of things. I know my boys are awesome. They texted me jokes about the Wizard of Oz. Bless their hearts, I raised them with an appreciation of humor, and they knew that if I was going to be swallowed by a tornado, that it was best to go out laughing. I know that the $9.99 I spent on the imap weather radio app was one of the best decisions I ever made. They Flying J was reportedly trashed, and I heard reports of traffic snarls on the interstate. I am so grateful I didn't end up there, trapped with few options. I contacted the developers of the iphone app that night, to let them know I was ready to rate their app now. Only there weren't enough stars. Mutt and I are headed for the farm now. We have renewed purpose in our quest for the uneventful road trip. a friend reminds me that I am loved deeply. I knew that, without doubt, as I waited for the approaching tornado. I know one last thing...brave is born of love, and flourishes there. I saw it, in my dog's eyes.